How do you learn to take measurements to make a school uniform if you can't read or write? ...don't know about numbers or even how to hold a pencil? Half of our students have never been to school. 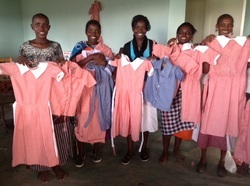 When they started learning how to make school uniforms in the beginning of March, we quickly realised we had an extra challenge! 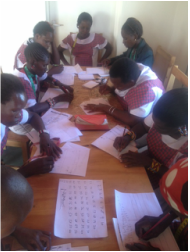 Nine of our precious ladies, aged 18 to 48, spent over a week learning to write with a pencil, learning their numbers, counting and measuring with a tape measure. I'm so proud of their determination and courage to learn these new skills in order to move forward. 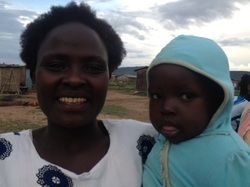 Last month, one of our students - Nariku - a widow with 4 children - was run over by an out-of-control motorcycle. She was knocked unconscious, and when she was coming to, she felt like God was calling her to give her life to Jesus and become a Christian. She suffered some injuries, but thankfully nothing extremely serious. The women at our school were moved to help her and took a collection between them of food and some money. Nariku lives in a village nearly 10km from our school (she walks every day! ), and we went as a school to visit her home, bringing her gifts, love and encouragement. At this time she told us about how God was tugging at her heart and she surrendered to Jesus. Praise God! She is now fully recovered and back at school. Our students have been making items for our Gift Shop, which will open in June in time for the tourist high season. Positioned strategically along the road to the Maasai Mara Game Reserve, we will provide clean flush toilets for the tourists and offer an opportunity to purchase items from our shop to support Maasai Threads of Hope. Our goal is to be self-sufficient by the end of this year by sales through our shop as well as contracts to make school uniforms. Getting the shop up and running will be one of my main challenges when I return in June. As I write this update, I'm traveling to Nairobi to go back to the UK and US before returning again in June. Our 1st Term has just ended and we celebrated our last day with awards for the best Exam Pieces, Character Awards and Attendance Awards. We want to encourage their hard work, especially those students who have had so many extra challenges. The long-awaited bore hole was finally drilled, which was to provide an unlimited water supply for the Maasai Threads of Hope School, and surrounding projects and community. Unfortunately, in reality, there is very little water down there! We're now making a backup plan to be able to increase our capacity to collect rain water up to 28,000 litres. We went as a school to the borehole site to pray over it, and ask God to release the precious water. We'll find out what the actual capacity is when the pump is connected, hopefully in the coming weeks. One of our students (and also first wife of our night watchman), Noonkishu Makooi had a very sick 1.5 year old baby. Many of you prayed for baby Lesikar when I posted on Facebook that we were making an emergency trip to the hospital an hour & a half away. I'm happy to report that Lesikar is now fully recovered, having suffered through Malaria, Pneumonia and an infected bowel obstruction in the space of 3 weeks. When we opened the school on 27th January, we didn't have a septic system or working toilets. Now as the 1st Term ends, we have working flush toilets, the fence with front gate is nearly finished, as are the outdoor kitchen with dining area and long-drop outdoor toilets for the students' use. In the future, when we're able to raise funds for a dormitory to accommodate Maasai women from remote areas, the kitchen and toilets will already be in place. I'd like to say a huge thank you for keeping us in your thoughts and prayers. Together we are making a difference in the lives of these precious Maasai women and their families, here in Maasailand and for Eternity. "Together we are wrapping the world with Threads of Hope."